Social welfare and open boarders are incompatible. Open boarders and a welfare state are incompatible ideas. The part of immigration most Americans take issue with is the part where millions of foreign nationals cross our borders and immediately qualify for billions of dollars worth of free stuff in the form of welfare, Medicaid, free schooling, and other government services. To make matters worse, many politicians understand this very well and pander to this group by promising even more stuff. Let’s face it, the United States is kind of like a really nice country club. The citizens have paid their initiation fees (learned the culture, history, and language) and are paying regular dues in the form of taxes. Here come these “outsiders,” sneaking in under the fence, and swimming in the pool without paying the initiation fee and, in many cases, the dues. Who wants that? Here is what I propose. Tear down the fences and put away the guns. Station one immigration officer at each entry point and have him/her pass out conditional “right to work” cards complete with Social Security numbers and the list of conditions. 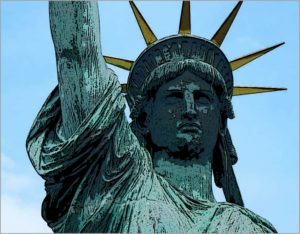 Any non-citizen of the United States upon entering the country must work for five total years (not necessarily sequential) and pay all applicable taxes, fees, permits, and licenses associated with his/her employment to become eligible for citizenship. During that five year period he/she will not be eligible for any United States government benefits of any kind, nor will that person have any right to vote in any local, federal, or state election. Card caring immigrants would, however, have the right to due process of the law (same as any citizen)and enjoy all constitutional rights. All money collected from said individual during the “five year no benefits” period in the form of taxes, fees, permits, and licenses will be applied directly to reducing our national debt. Children of said immigrants would be eligible to attend public schools and eat school lunches for a nominal fee. Upon completion of the five year, “no benefits work period,” any immigrant can apply for citizenship by taking a test. The test (which will be written and administered in English) would include comprehensive questions regarding the U.S. Constitution/Bill of Rights, the virtues of Market Economics, and basic U.S. History. After successfully passing the test with a grade of 90% or higher, the subject would receive full citizenship and enjoy all rights and privileges associated with that designation.